In you were not living under a rock you have probably heard that the days of cotton swabs are over. Cotton swabs used to push the build up ear wax further down the canal and were causing more damage than good to your ear health. But what is the alternative to using cotton swabs? In this guide, we are covering the best alternative tools which will help you to safely remove ear wax using different strategies. Make sure you read through our review of 2019 ear wax removal tools before you invest any money. Halili Care Ear Wash System is the product that most resembles visiting your local physician’s office for an earwax cleaning that we have found on the market. A compact bottle fitted with a nozzle which is used to irrigate the ear canal and quickly and practically remove the earwax build-up. This is the safest method of cleaning, making sure you don’t push the wax further back into your ear. A special powdered rinsing solution that helps the cleaning go smoothly and a half ounce bottle of earwax removal drops to soften the wax before the washing process itself. The drops contain aloe vera and chamomile essences which moisturize the skin in your ear and help prevent dry and irritated skin. Three packets of the rinse powder as well as three disposable tips which are attached to the bottle nozzle. Once you have used the tips included in the original package, additional tips can be purchased separately for your convenience. The tips are also fitted with a protective guard that stops you reaching too deep inside your ear and causing possible damage. An added bonus not included in most kits is the ear basin, which provides you a practical container to drain the ear wash in so you can complete the cleaning cleanly and mess free. The Elephant Ear Washer System is designed to simply, quickly and inexpensively clean your earwax build-up in a more natural way. Easy to use, it will take care of your problem in matter of minutes. Three different disposable tips are provided for you to attach to the nozzle, then you simply insert the tube inside your ear canal and the water stream moisturizes the earwax and creates enough water pressure to dislodge the build-up. The bottle contains enough liquid for you to be able to clean both ears in one go without the need to refill. The tube is fitted with a protective stopper, so you do not have to be worried about inserting the tube too deep inside your ear and contacting the sensitive eardrum, causing possible damage. Additional disposable tips are available for purchase separately once you have discarded the tips provided with the original kit, so if the problem occurs again you are ready to take care of it. The USB endoscope is a newly developed tools which makes it possible to check the inner situation of your ear canal and remove the earwax build up at the same time. It uses an ultra small HD lens and transfers the live video through a data cable directly to your phone. This makes it possible for you to have a clear overview of your ear canal and if the ear wax was removed successfully. Ear disease patients can also observe their ear canal if it is healing up correctly. Multi-functionality: not only can check the ear canal, but also can check the eardrum, mouth, gums, throat, nasal cavity, scalp hair root and other body parts. Easy to use: The earpick is longer, thinner and easier to use. This ear pickers are made of medical grade stainless steel, which is a high durable and anti rust material, easy to clean and sterilise. They are made for safe and easy use and are perfect for adult and child use. Based on the special scoop shape this tools are not pushing the ear wax further into the ear canal like cotton swabs, but effectively scratch it out. The Dr Mom Slimline Otoscope is an instrument equiped with a highly durable and bright LED light along with a glass lens, which enables you to look inside the ear canal to check for earwax build up or possible ear infection. The unique feature of this instrument is that it also doubles as a lighted ear curette. The kit contains two different attachments – a scoop tip and a loop tip, which provide you with all the tools necessary to remove the stubborn earwax. The instrument is not equiped with a guard so be careful not to reach too deep inside the ear canal. This ear cleaning tool is safely stored in a hard case which is ideal for travelling or just storage at home. The case contains the otoscope handle, two otoscope heads, two ear curette attachment heads and two batteries, so everything for your ear monitoring and cleaning needs is nicely stored in one place. The kit also includes several high-resolution ear drum images for comparison and weblink with detailed instructions. The first choice of cleaning your earwax without (causing any harm) any harmful effect to your eardrum and your hearing is the Ototek Loop ear cleaning tool and Removal Drops bundle. The bundle contains a half ounce bottle of Ear Wax Removal Drops. The drops act as a softener of the earwax, which enables you to gently and quickly move the excess wax to the outer ear. The loop earwax removal tool will not be needed If the drops are effective. In case you are having difficulties removing the wax, use the loop tool to simply clean your ear canal in matter of seconds. The loop tool is designed with safety in mind. It is equiped with a guard that prevents the tool from reaching too deep inside your ear and contacting the sensitive ear drum. Furthermore the tool is designed in a way to remove the earwax without pushing it back against the ear drum. This design makes the product safe and easy to use. The tool is reusable, just wash it in soap and water. Also called cerumen, ear wax occurs naturally in the ears to keep them healthy. It is secreted by the ceruminous glands in the ear and keeps dirt, dust and other particles from harming the eardrums. As time passes, the ear wax tends to build up and dry out. At this point, it is pushed towards the outer portion of the ear. When this happens the wax usually collects faster than the body can remove it so it builds up more. Parents know what ear wax is at its most basic but it helps to know more. It is composed of a sticky substance along with dead skin cells and it is produced in the glands that line the inner ear. It can be unpleasant but it is normal in infants. It helps their bodies prevent infections and other problems. Most of the time an infant’s ear wax will be sticky or dry. Both types are perfectly normal and will not require a trip to the pediatrician. What Is The Normal Level Of Ear Wax for an Infant? There is no normal level for babies. No specific amount is considered as normal but it is common to see it build up in a child’s ear. Sometimes, one ear will have more wax than the other. The reality is that there is no normal level to consider normal for an infant in either ear. What Is Causing Ear Wax Buildup? Cotton swabs. Well-meaning parents often use these to gently clean the baby’s ear, however, these swabs are among the most common reason for earwax to build up. It causes the discharge to be pushed back into the ear and can cause blockages. Fingers. A parent may try to move the wax out with good intentions but using fingers can do just as much damage as cotton swabs. The finger can cause ear wax to be pushed back into the ear. Earplugs. Any type of earplug can cause the wax to get pushed back into the canal and may cause a blockage. When Is It a Problem For My Child? The only time ear wax should cause concern is when it is obvious the wax has plugged up the canal. This is evidenced by poor hearing, itching, earaches and the child hearing odd noises. More serious problems are causes when wax traps water in the external portion of the canal. If you notice your child is not responding to sounds or is showing signs of discomfort or is rubbing at their ears, it could be that there is a blockage. Have them looked at by a pediatrician. 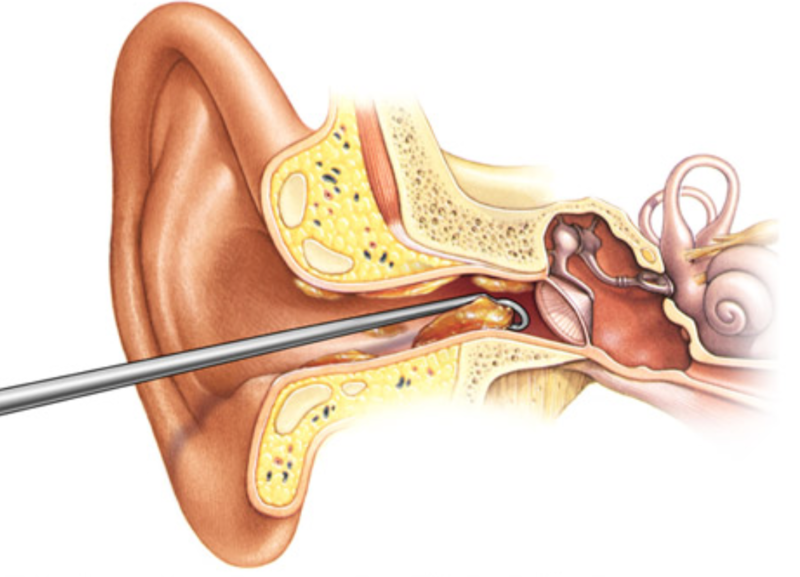 What Is The Difference Between an Ear Infection and Ear Wax Buildup? It is hard to figure out if the child has an ear infection or just ear wax buildup. They both can cause an infant to tug at their ears. They may also rub at them or dig at them with their fingers. With ear wax build up, the child will not have problems sleeping and they will not suffer from fevers. This is the case with actual ear infections and the child should get to a doctor immediately. What Is The Best Ear Wax Removal Tool? Parents may think that the best way to get rid of ear wax in a toddler or an infant is by using a cotton swab. When you try this, it only pushes the wax further into the canal. This can cause a serious problem. It can also cause damage to the eardrum. A better solution is to use an ear wax removal kit which you can buy at a local pharmacy. These can be expensive and may not be the right solution for your child. You may also opt for special ear drops which will help the wax move towards the outer area of the ear.